Now that joining up all these wires underneath the baseboard is an imminent task, I'm once again looking at snap lock connectors. 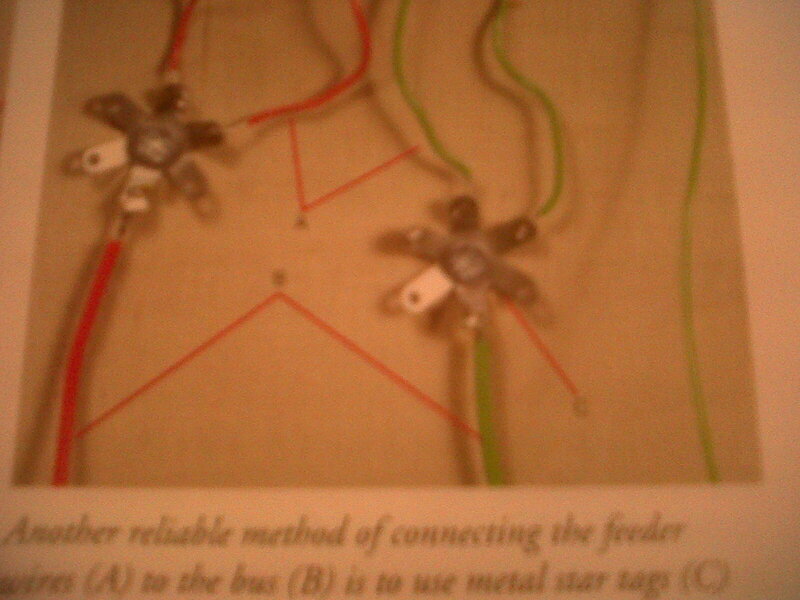 They are without doubt the quickest way of connecting feeder wires to the power BUS and their use does not involve the power BUS being cut into sections - as is necessary when using choc blocs. But first of all I thought I would have yet another test of the system using a 12v pea bulb, a battery and some crocodile clips. 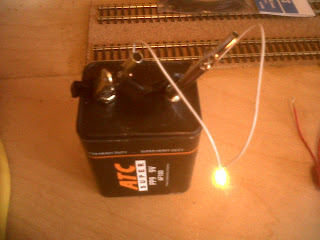 First: check that the bulb and battery both work. SUCCESS. 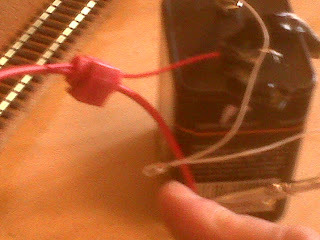 Second: intersperse a snap lock connector and a short piece of power BUS and a short length of feeder wire. 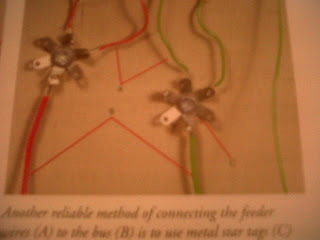 FAILURE - my finger is pointing at the unilluminated bulb. I had seriously considered using choc blocks but am less convinced that they can grip the THIN feeder wire and the THICK power BUS - suspect that the feeder wire would have a propensity to slip out. However, I could find no mention of them on the internet, and Maplins in Glasgow don't stock them. Will keep thinking - or as it is more accurately known, procrastinating. 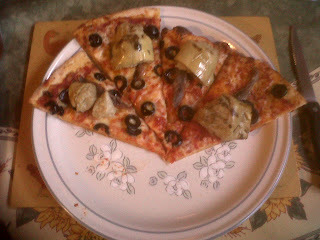 Last night's dinner: Pizza with black olives, anchovies and artichokes. Is the food replacing the music? 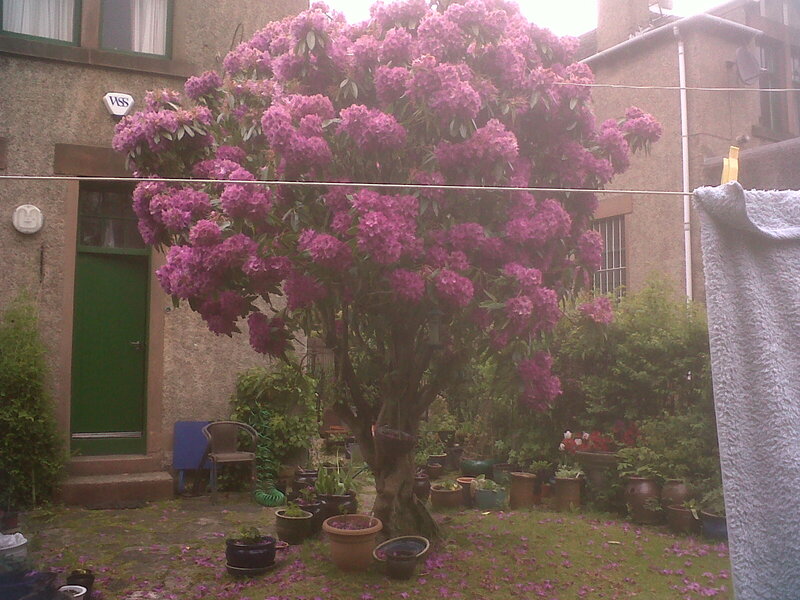 Augmenting it - I find the exercise very instructive. To see one's meals as others see them.